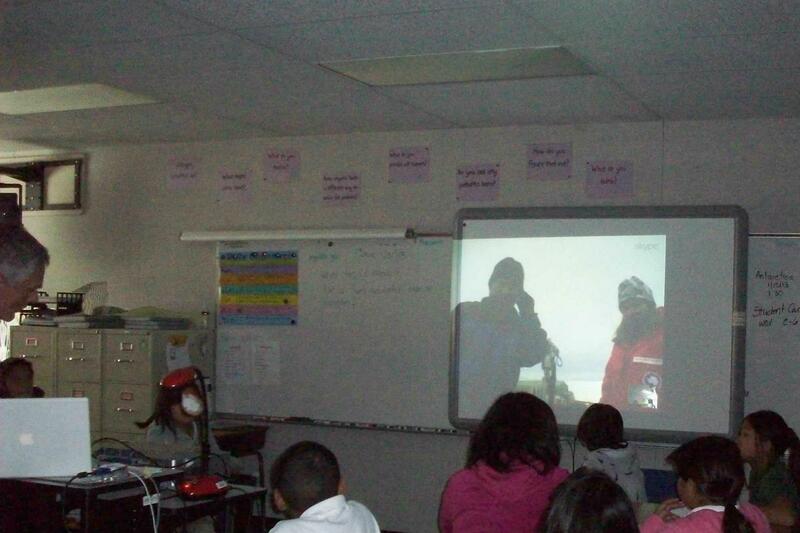 Working on an otherwise-deserted Arctic island the size of the US state of West Virginia requires patience and complex logistics. 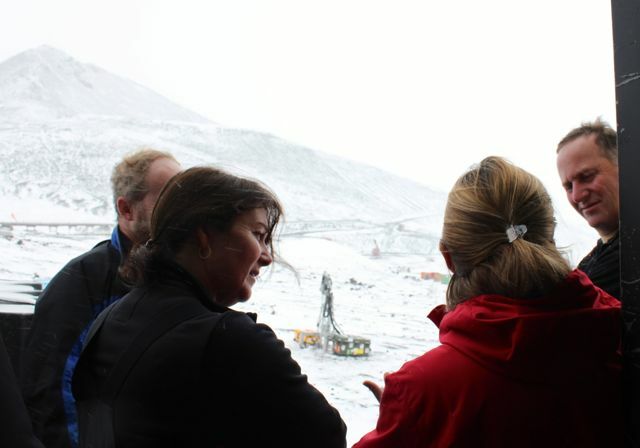 Delays are commonplace as flights often operate only one or two times a week using small aircraft. 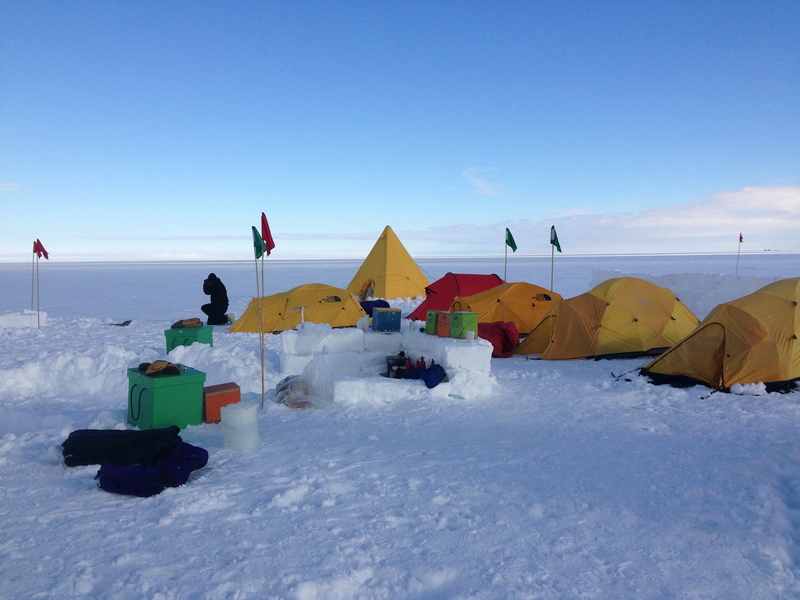 Resolute has had weeks of bad weather… our HMP-14 team had flights cancelled twice and spent two unplanned days in Iqaluit. 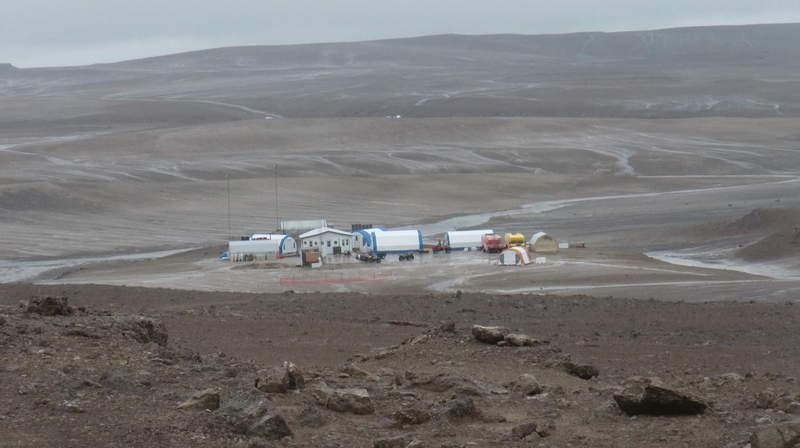 Streams appear during heavy rains around the Haughton-Mars Project base camp on Devon Island. 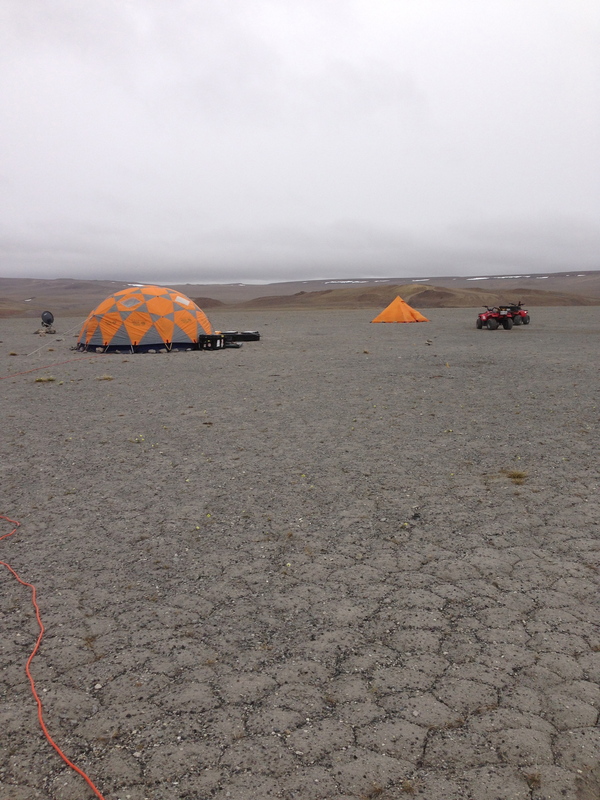 A flash flood caused the camp to be temporarily isolated from the crater itself (uncrossable by ATV). 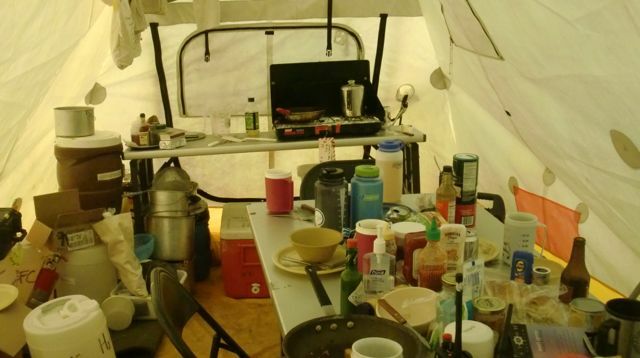 Once in the field, the travel delays have left us with a shortened field season, only 8 days long. 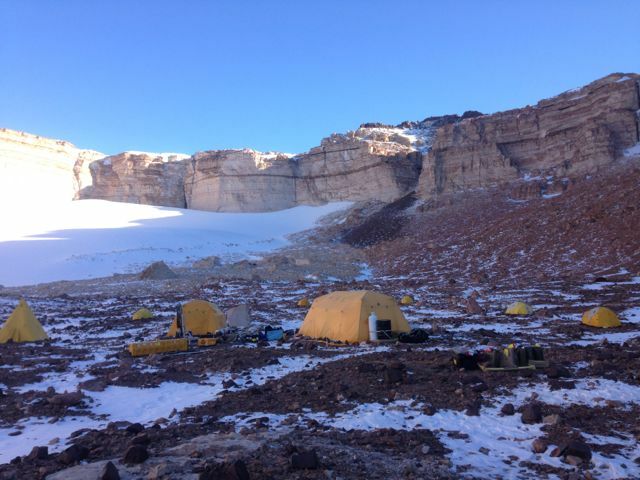 And even that has been affected by a cold and wet summer, even some flash flooding that temporarily left HMP base camp isolated from the crater trails, until waters subsided. 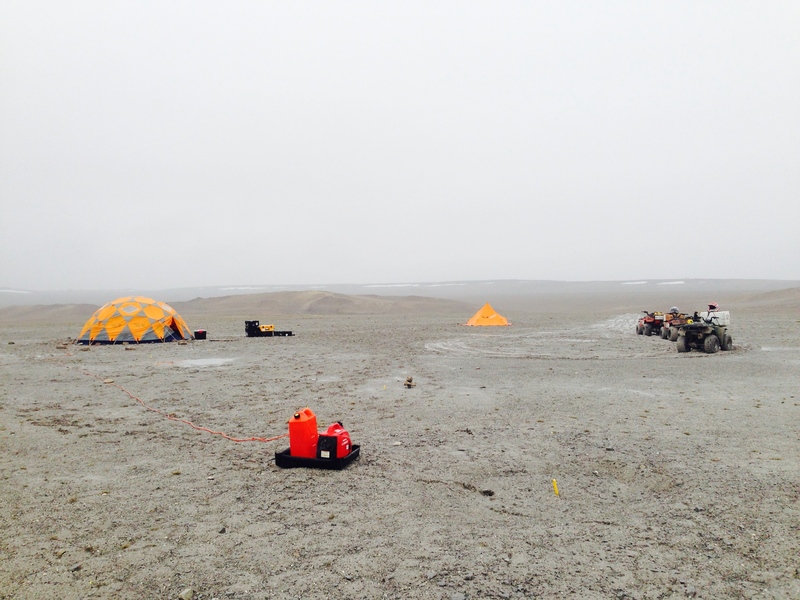 Drill and robotic test camp inside Haughton Crater. 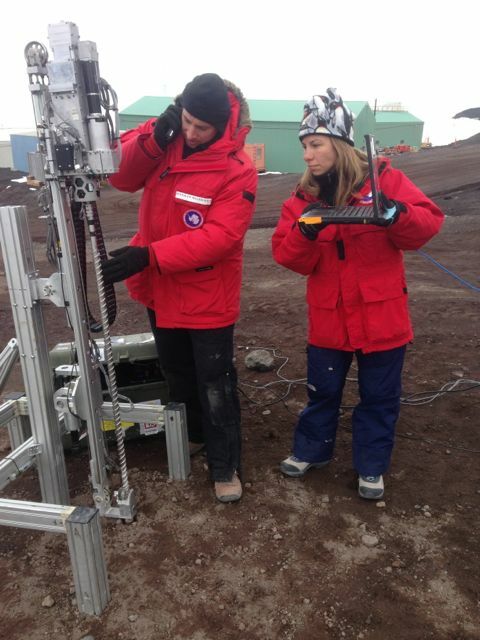 “Drill Hill” impact breccia and permafrost make it an excellent textural analog for Mars drilling tests. 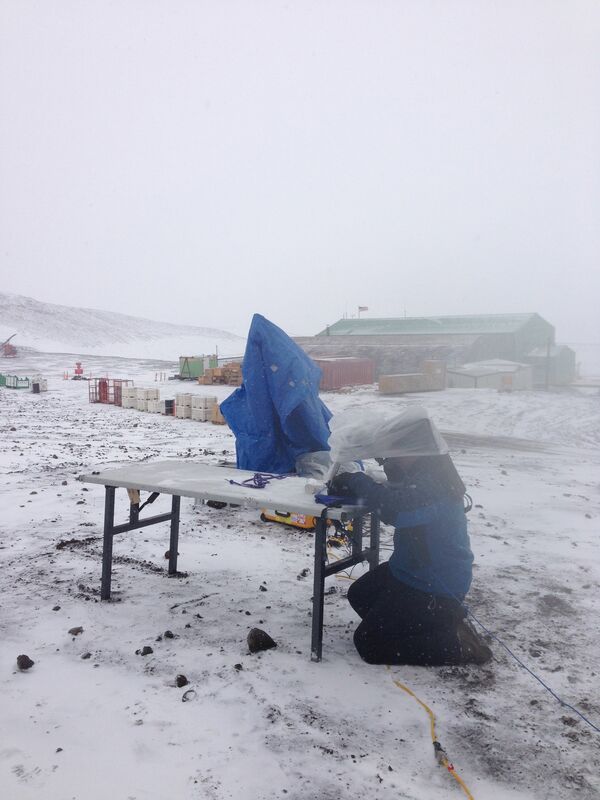 Despite the delays, our team has persevered and set up the work camp at Drill Hill inside the crater, to test our prototype Mars drill and sample transfer arm. We have gotten a couple of gas samples for GETGAMM, and remain optimistic that we can catch up overall and still accomplish our technical goals. Ames student intern, April Davis, furrows in concentration while reassembling a sample transfer robotic arm. 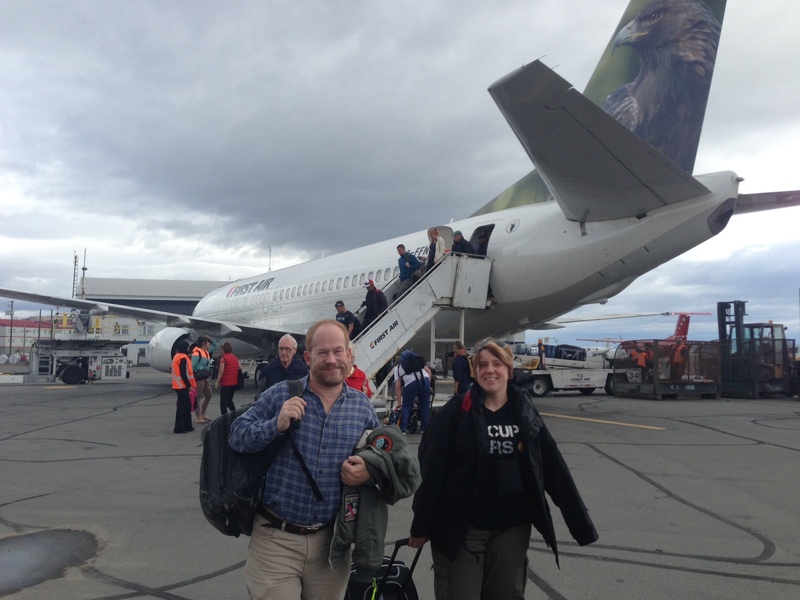 Ames team members (Brian Glass and student intern April Davis) arrive in Iqaluit, en route to Devon Island, Nunavut. 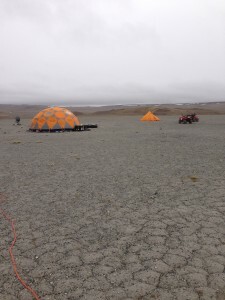 An Ames-led group of six departed California, Tennessee and Grise Fjord during the last part of July, headed for Resolute, Nunavut and then a charter flight to the NASA field test site at Haughton Crater on Devon Island. 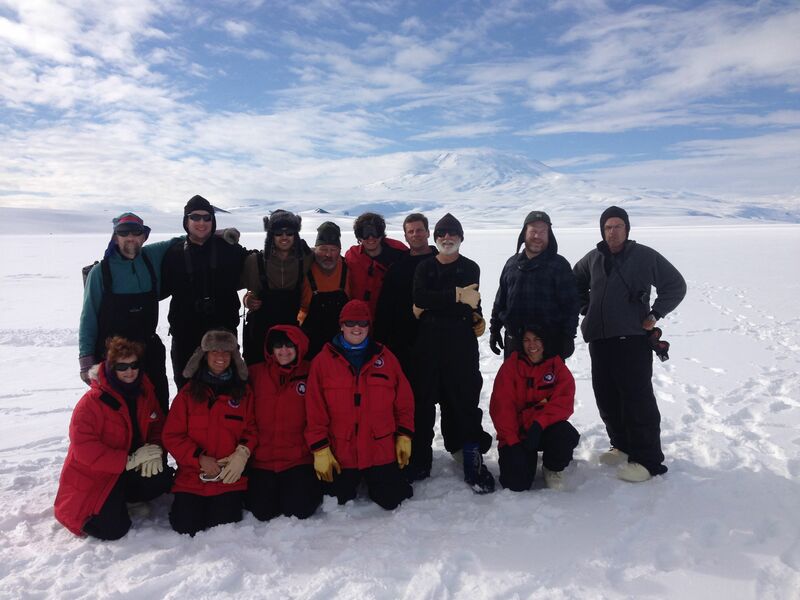 Team members for the current 2014 Haughton Crater deployment are: Dr Brian Glass, NASA Ames; Dr Pascal Lee, Mars Institute (based at Ames); April Davis, a student intern at NASA Ames; Bolek Mellerowicz, Honeybee Robotics; Jesse Weaver, Knoxville, TN; and locally Pauline Akeeagok from Grise Fjord. Haughton Crater is a 20-km diameter impact structure with well-preserved beds of ice-cemented impact breccia, and is considered an excellent-fidelity Mars-analog site. 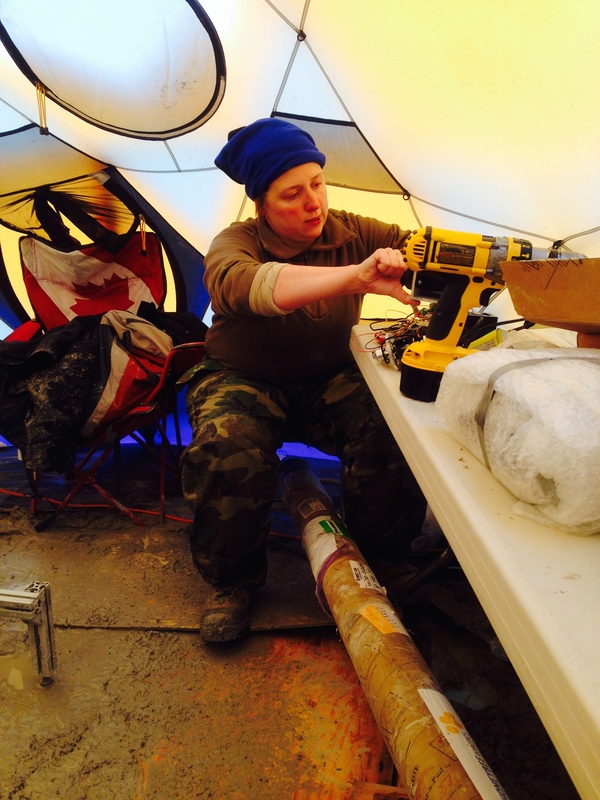 Team members will gather gas samples to acquire more data on concentration and carbon isotopic composition for both methane and carbon dioxide collected from sniffer drill strings, for assessing both the flux and source of background methane emission from bedrock in the Arctic. 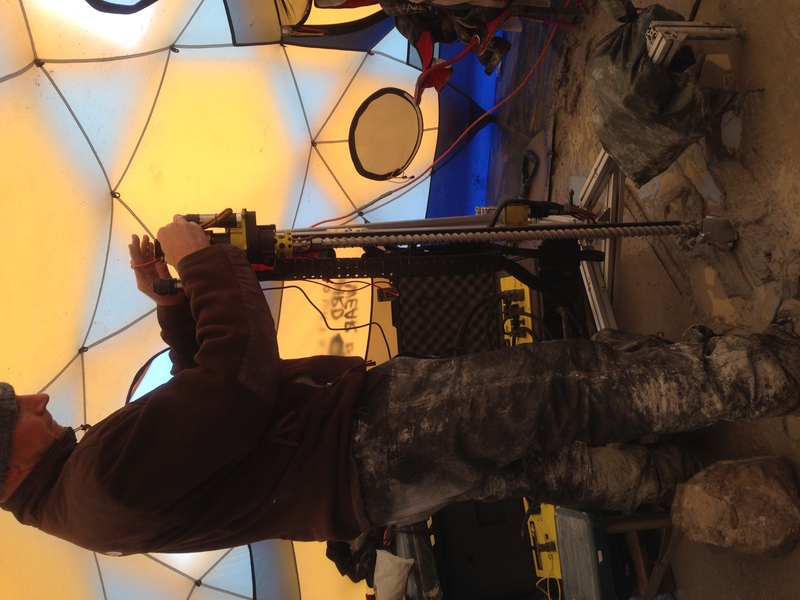 A new rotary-percussive planetary-prototype drill will be put through its paces at the Haughton Crater “Drill Hill” breccia site inside the crater. 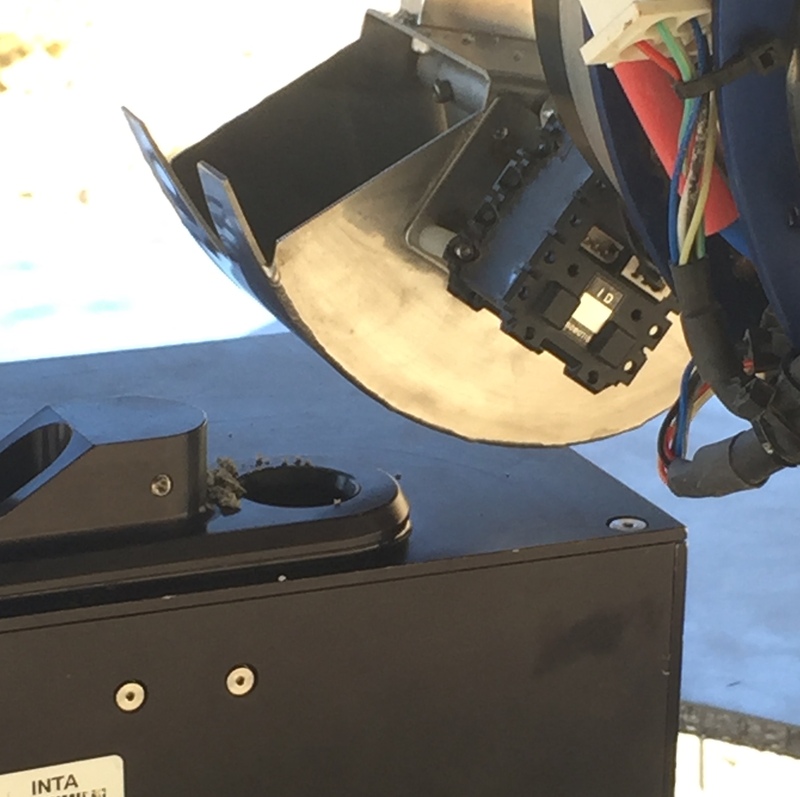 For the past decade a series of SMD-funded projects have advanced the technology readiness of both planetary drills and the automation needed to operate them at significant lightspeed communication distances from Earth. 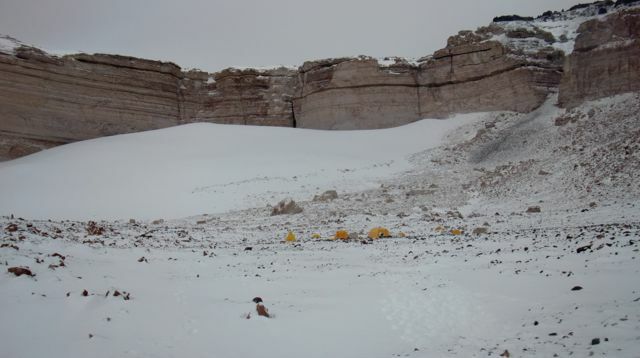 Drilling will be needed to access the Martian subsurface at depths of 1 meter or greater, and to penetrate the ice layers found by the Phoenix mission at the poles. 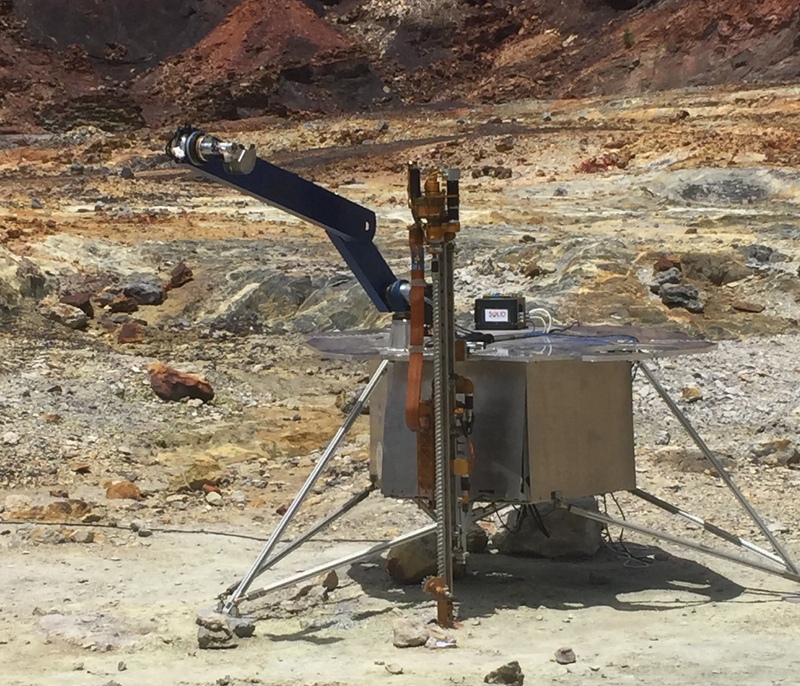 It is the best means to retrieve samples from regions on Mars that could possibly harbor life now or in the past, and is a needed sample acquisition technology for multiple mission concepts proposed for 2020 and onward. 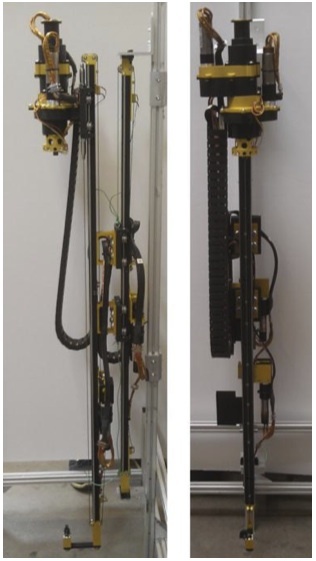 The most recent generation of Mars-prototype robotic drills is the Icebreaker-3 rotary-percussive drill (see photo), which was tested in laboratory conditions this June at Honeybee Robotics in Pasadena. 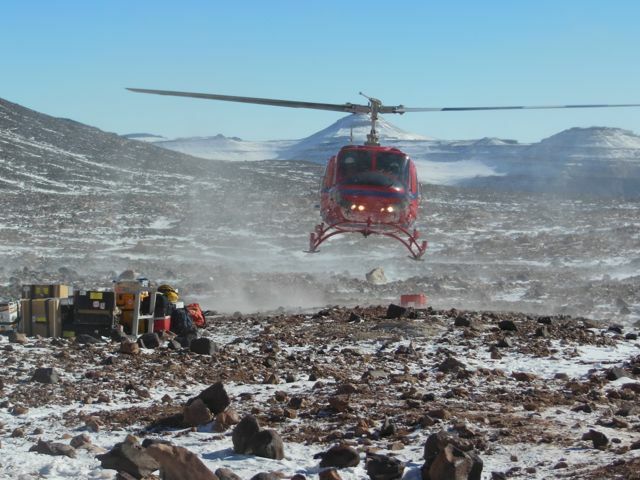 Its predecessor, the Life In The Atacama (LITA) drill, was tested at Haughton Crater in August 2013 (see earlier Mission:Ames posts) but lacked sufficient torque and shaft stiffness to make any significant penetration into the ice-cemented impact breccia at Drill Hill. 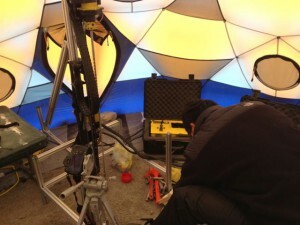 Earlier, heavier drill designs were capable of successfully drilling to 1-3m at the site with the same drilling technology, but are too heavy to propose on an early-2020s Mars mission. 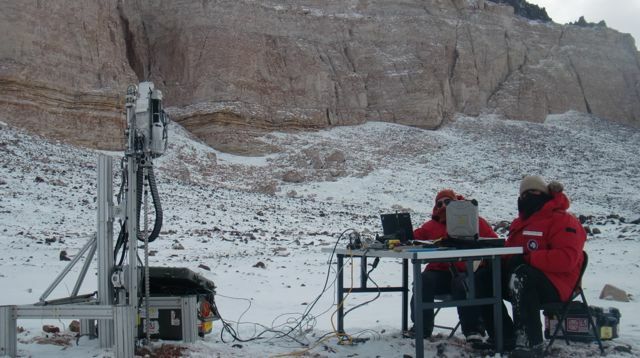 The current GETGAMM ASTEP project (by Indiana, GSFC, JPL, and Honeybee Robotics; Dr Lisa Pratt, PI) uses deeply eroded Paleoproterozoic bedrock in southwestern Greenland as an analogue for Mars. 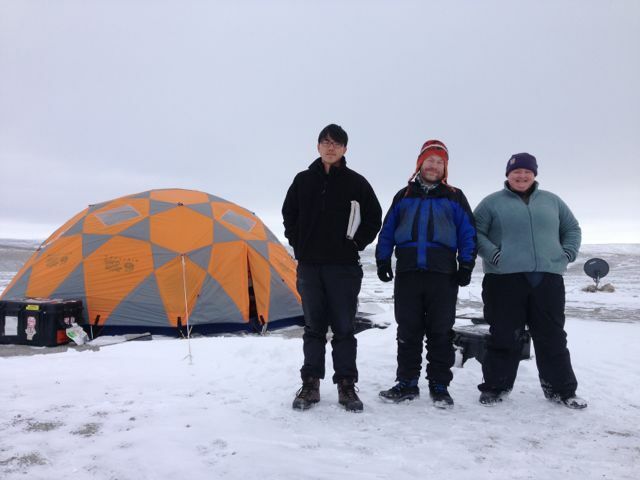 In a three-year field campaign, the project has analyzed seasonal and diurnal variation in the concentration and isotopic composition of methane, ethane, and hydrogen sulfide in bedrock boreholes. 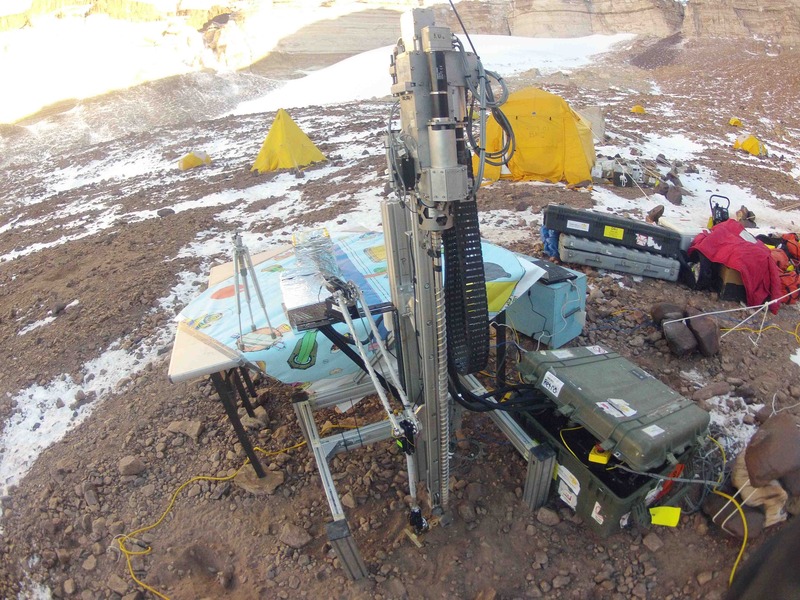 GETGAMM has also used a copy of Honeybee’s “Life in the Atacama” (LITA-1) ASTEP-developed drill to drill 1-2m boreholes for monitoring. Unlike most drilling scenarios for planetary missions, however, GETGAMM jettisons its drill strings in each borehole rather than bringing them back up for other holes – requiring many drill strings, which serve as emplaced shaft casings to keep holes open for subsequent gas monitoring. 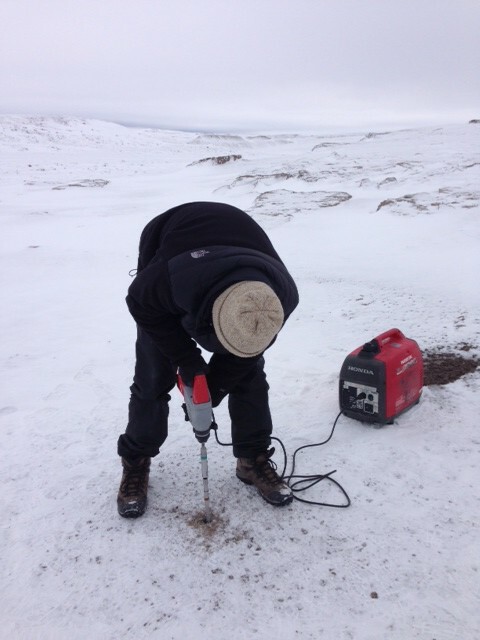 In addition to its extensive Greenland field work, GETGAMM in the summer 2013 field season placed and sealed two monitoring drill strings at Haughton Crater (HMP Sites 2 and 3) which remain there currently (see photo). 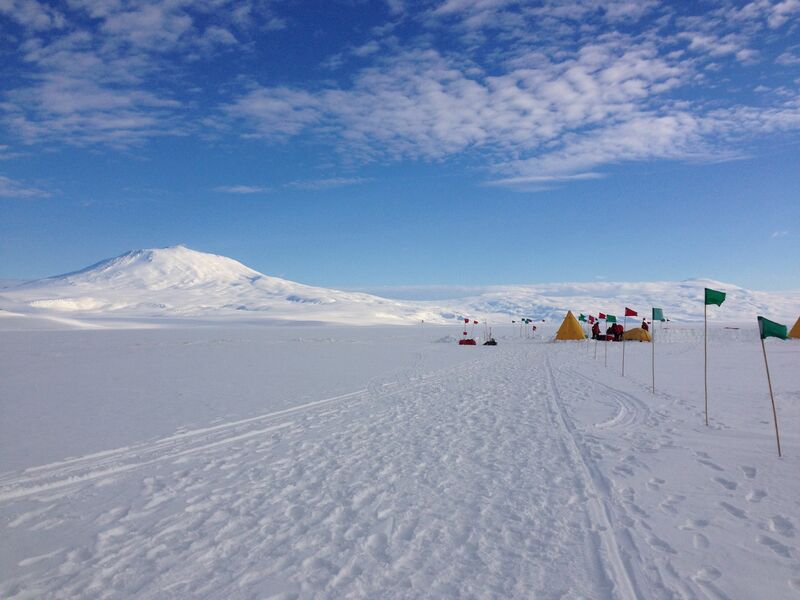 Methane (CH4) emissions on Earth are predominantly derived from thermal cracking of ancient organic matter in the deep subsurface or from microbial methanotrophic metabolism in low-salinity aquatic environments such as wetlands and lakes. 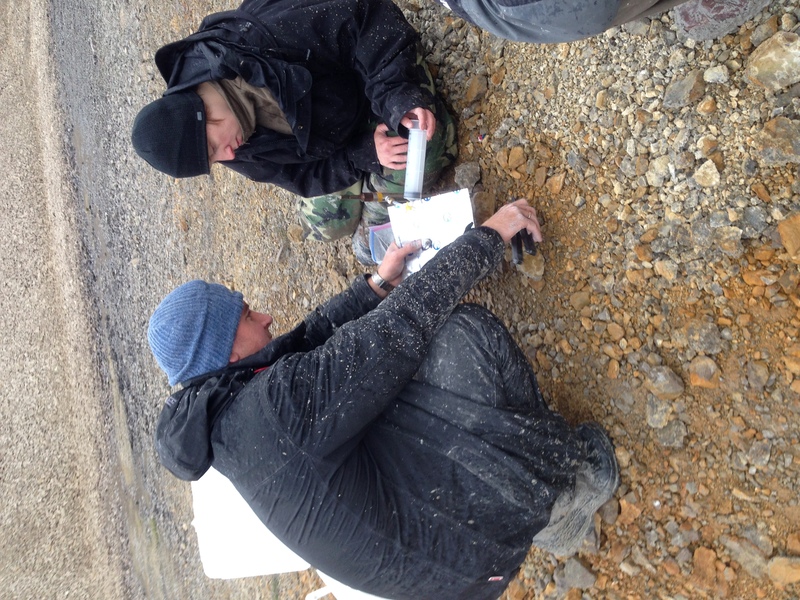 Although seasonal methane emissions from wetlands and lakes in Arctic regions are starting to be reported, there is virtually no published data on background methane emissions from unvegetated zones of fractured bedrock where methane could originate from underlying sedimentary strata or from adjacent wetlands and lakes. GETGAMM study sites in Greenland (visited by Indiana University this past April) and the current deployment to Haughton Crater provide an opportunity to compare methane emissions from Archean-crystalline versus Paleozoic-sedimentary bedrock using perforated drill rods (sniffers) installed down to depths of 1 to 2 meters below the surface.